With the Chiefs out of the playoffs, we decided to look back at the entire season: the ups, downs, and outright bizzare moments. The review will be posted in three parts, this being part 1. What a crazy season. From Dexter McCluster fumbling the opening kickoff of the season to Phillip Rivers’ self-proclaimed “worst day ever” to the firing of former head coach Todd Haley, the 2011 Kansas City Chiefs season was one of underachievement, disappointment, and just plain ridiculousness. Kansas City finished the season with a record of 7-9, missing the playoffs for the 4th time in the last 5th seasons and failing to reclaim the crown of AFC West champion. 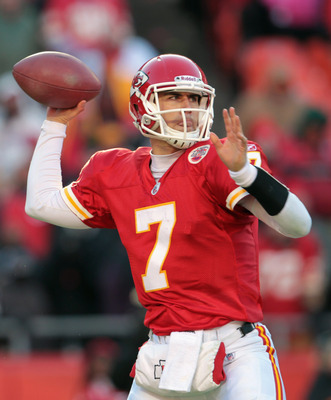 The Chiefs, led by quarterback Matt Cassel, looked primed for another AFC West Title at one point in the season. September 11, 2011 – It was opening day in the National Football league, and the beginning to perhaps the most anticipated season in NFL history due to the labor disagreement between players and owners that had dominated the sporting world for the majority of the NFL off-season. The Chiefs were hosting the Buffalo Bills and coming off a brilliant and most-unlikely 2010 season that saw them win the AFC West for the first time since 2003. Chiefs fans everywhere were as excited about their team as they had been in almost a decade. Dexter McCluster took the opening kickoff, ran up the right side, and fumbled the ball. Buffalo recovered, and nothing seemed to go right for Kansas City the rest of the day as the Bills poured it on in a 41-7 rout of the Chiefs on opening day. To make matters worse, the Chiefs lost their pro-bowl safety, Eric Berry, for the season to a torn ACL on the third play of the game. It was the most lopsided season-opening loss in Chiefs history. The season seemed doomed from the very beginning. In fact, not a lot went right for Kansas City until week 4 of the season when the Chiefs returned to Arrowhead Stadium to host Adrian Peterson and the Minnesota Vikings, each team looking for their first win of the young season. Coming off an absolutely embarrassing performance against the Detroit Lions in a 48-3 loss in week 2, a game in which the Chiefs also saw their all-pro running back Jamaal Charles lost for the season with a torn ACL and MCL, and a uneventful 20-17 loss at the hands of Phillip Rivers and the San Diego Chargers, Matt Cassel and the Chiefs finally notched their first win of the season while holding Adrian Peterson to only 81 yards on 23 carries. Following the bye week, Kansas City ripped off 3 consecutive victories; a comeback 28-24 victory over the hapless Colts in Indy, a dominating 28-0 win in the Black Hole against newly acquired Carson Palmer and the rival Raiders, and a thrilling 23-20 victory in overtime on Monday Night football on Phillip Rivers “worst day ever.” The defense led by Derrick Johnson and Tamba Hali was beginning to show significant improvement, even without Eric Berry and the offense was adjusting brilliantly to the loss of Jamaal Charles. Before you knew it, the Chiefs were 4-3 and in the first place in the AFC West. Head coach Todd Haley had his team believing, and with Matt Cassel playing at a high level, another AFC West division title was not out of reach. The Chiefs had two golden opportunities to put themselves in prime position to capture the AFC West with the Miami Dolphins and Denver Broncos (at the time their combined record was 3-12) coming to Arrowhead in the proceeding 2 weeks. Put those two on the board as wins, and move on at 6-3, right? So it seemed. This entry was posted in Football, Home, Midwest, Uncategorized and tagged Chiefs, Football, Matt Cassel, reviewing season.